My friend Pauly called last week and we reignited our conversation about lap times... lap times as the sole determining factor regarding which group trackday riders are placed in. At first glance it makes sense because it gives a definite level to each group and guarantees each group will not be: A) Strafed by ultra-fast riders or B) Balked by ultra-slow riders. Most track-day organizers go with three groups, and those groups are based on experience. Slow, Medium and Fast is the basic idea no matter what the label. It's an easy step to assign lap times to each group and that would be a specific and measurable way to let riders know where they belong. I like the idea. But Pauly called about an experience that he believed led to a bad crash when a rider was convinced that lap time was everything. This rider believed that if you could run the lap time, then you were good at the sport. Lived and died by the stopwatch. And I mean died. Pauly had grabbed this rider and talked about apexes, taking away lean angle on the exit, using the brakes to point the bike, slowing down the hands... he had said, "You are going to hurt yourself badly if you don't work on these things." Pauly frankly didn't care about the lap time because he saw so many other problems. He can no longer talk to this rider. 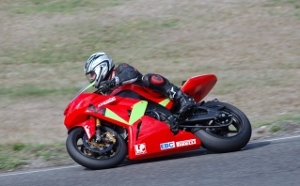 This rider died at a track day. This rider was closing-in on the lap times necessary to get into the fast group. That was the goal. The things Pauly tried to discuss were a distant second to what the onboard timer said. So.... lap times. How about you use them as secondary measuring stick? Second to the number of apexes you hit. Second to the number of times you scare yourself or the way you maximize the track. Second to the number of times you lose grip, run off the track, stab and grab, flick and throw. Second to the number of times your on-track decisions differ from those of the fastest/safest riders, guys and gals like Pauly who go quick with little drama. Look at the lap time you can run ten laps in a row. Or on used tires at the end of the day. That will be a worthy measuring stick for your progress. Throwing in one blitzkrieg lap on brand-new tires chasing the fastest guy at the track will not represent what you are actually capable of during a track-day session, yet the rider focused solely on the stop watch will believe this blitzkrieg lap is representative. At the magazines... I have worked for Motorcyclist, Sport Rider or Cycle World for the last twenty-eight years... we would try to run each bike entered in a shootout at the same relative level of desperation/aggression/desire during the track portion of the test. We knew if the tester "threw his brain out the window" on one particular bike, the lap time would be quicker... but not necessarily represent where the bike fell in the order of racetrack prowess. That's why you'll see multiple riders test bikes in Roadracing World, for instance, because multiple riders' lap times begin to give a much better picture of what the bike can actually do. Apply this type of thinking to your own lap times. A few years ago I raced the NCR New Blue at Daytona for Cycle World. I finished with a third, a fourth and a fifth in the three races. But when Ken called to see how things went, I answered: "I missed five apexes..." We laughed about my answer, but it's truly how I looked at the weekend. Yes, I was happy with my finishes but had realized a long time ago that good finishes come with good riding. Thank you Eddie Lawson. And good lap times come with good riding... not vice versa. You can't become a better rider by simply trying to set a new lap record. Ken and I firmly believe that if you start with and stick with the essentials of this sport, the lap times come. Notice I added "stick with" the essentials. You wouldn't believe the number of ultra-fast YCRS graduates who tell me, "I just keep working on the non-negotiables you guys teach, the champions habits." I take lap times on my bikes and in my cars at track days, but use them in conjunction with the amount of effort I'm expending. Lap times help indicate tire wear, the success of a new line, the result of a gearing change, how much desire I have on that day. Get the idea? They are another tool to improvement, but rank far behind the number of apexes hit or missed. My opinion on lap times is just that, but what about someone who has run track days for the last thirteen years? Dustin Coyner of TrackDaz (	www.trackdaz.com) chimed in with this: "I can't begin to tell you how many times I've addressed this very thing. This is the reason we don't use lap times specifically as the final measuring stick with regards to who belongs in what group. If people took the time to learn to ride better, they'd have much less drama out there on the track. Those riders who are 'on the edge' currently could probably do the same times or better if they were riding with more control." Um... Coyner is a YCRS grad and one of the earliest fastersafer.com members. Ken and I talked about something at dinner last month that ties in with Pauly's call and Dustin's comments: Better machinery and tires can produce a good lap time despite sloppy riding... but... the laws of physics will never rest, never be fooled. The amazing modern sportbike will get a rider to within sniffing distances of the fastest riders in that particular class because grip, lean angle and electronic wizardry is fantastic. But as you know, finding the final two or three seconds to reach the class lap record is where the true work is, the time and place where the human element must contribute the most to aid the amazing motorcycle. Pauly watched this play out and nothing he said registered... because the lap time looked okay. Kinda close to the fastest riders in that class. Not bad... until a rider of Pauly's knowledge watched how that lap time was produced. He literally winced as the rider traversed a corner because he knew that the only saving grace that rider had was an incredible motorcycle and unbelievable grip. But grip rarely improves during a track day. Yamaha Champions Riding School aims to give track riders and racers the knowledge to coach themselves to a quick, repeatable lap time - emphasis on repeatable. Numbers aren't worth dying for.